Twilight dissolved into full darkness as I made my way across the boggy meadows to the turn-around at the Porcupine Ridge aid station at mile 48. It's the time in a race I've really come to enjoy. 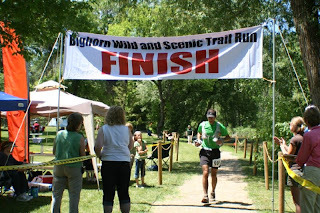 And Friday's Bighorn 100 was no exception. The harshness of the day softened; the maddening crowd of the early going dispersed; and the questions starting to be answered. How do I feel? How's my pace? And most importantly for my first 100 mile attempt: How are things looking for a finish? Until this point, I really had no answers. The warm, 11am start at the Tongue River Canyon, while wondrously beautiful, made the day already feel long even before the gun. But it gave me a chance to chat with a couple great Fort Collins guys I'd only met via blogs and attackpoint.org, who would both go on to very strong finishes: Nick Clark (2nd) and Pete Stevenson (7th). At the gun, it was up the canyon on the gravel road a couple miles; then on to some undulating, singletrack for another couple; then, the first extended climb that would be surprisingly crowded until the next aid station. It certainly challenged me mentally. My legs didn't feel particularly spry; my stomach felt bloated from mishandling the late start, and the tailwind up the canyon kept things feeling warmer than they should have. The Upper Sheep Creek aid was great to see (mile 8.5). A chance to fill bottles and shake off the climb. Things began to spread out a bit as well, and I got to run on and off for a number of miles with Steve Kirk (RD of 3 Days of Syllama, who'd have to eventually drop at the turn-around with an offline stomach), Ashley Nordell (who'd soon drop me and go on to win the women's race in 24:51), and Trevor Hostetler (who'd finish after some hiccups on the way). Aid stations came and went, I ate my PB & J's, drank my Nuun and Succeed products, and took many photos of the amazing scenery. The climbing kept going, the mud kept getting deeper, darker, and less avoidable. Night began to fall, and I finally had some early answers. Nearing the mile 48 highpoint of the out/back course: My stomach was feeling good; my pace felt good; and knowing there was a long way to go, I was beginning to sense that a finish was possible if I kept positive and to my plan. After the turn-around at Porcupine Ridge ranger station around 10:30pm, I headed into full darkness and crossed paths with runners heading up (some feeling better than others). This part of the course was marked by wide, watery (often trail-less) meadows and expansive views of the milky way. I'd just mark the next glowstick and slurp my way along to it -- sometimes quickly realizing I was heading for a low-slung star instead. Of all the memories of this day, those from this section are the most vivid. From here, I passed through a couple aid stations -- passing a couple bonked runners on the way -- and got back to the major Footbridge station (mile 66) around 3:30am, still feeling good. After a quick weigh-in, the real run for home then began. Out of Footbridge is a big, nasty and often muddy 2500 foot climb over 3.5 miles. It was slow going, and as the day began to dawn, my energy began to drain. I was able to keep up a good steady pace up until Cow Camp aid (mile 76), but from there on, I picked my way home, trading leads with Ogden runner, Tom Remkes (who'd eventually get me by six minutes). Although I could keep taking gel after gel up to the finish, my legs just couldn't seem to muster any energy, and my quads screamed on anything but the slightest downward pitch (of which there are very few in the closing miles). Seeing my hubristic goal of a 24ish time slip away, I grew a bit despondent, but kept picking my way home. When I finally hit the Tongue River Canyon road aid station (mile 94), I figured out that if I ran 90 percent of the closing miles, I could come in under 26 hours. So I filled my bottles, pounded four more gels, and shuffled for home in the now hot mid-day sun, crossing the line in 25:35 -- good enough for 11th place. While I may have wanted a bit more, I'm extremely happy with the result. Eleven months after my first ultra (the White River 50), I was able to toe the line and finish a challenging 100 miler -- and most importantly live to tell about it. I can't thank my much more accomplished training partners enough for sharing their tricks of the trade that really made it all possible. Still, I've got a lot of work to do, a lot of troubleshooting to perform. But for the time being, I'm going to put my feet up for a while and just enjoy the moment. Don't tell my Wasatch pacer. Great job, again, Hank! Can't quite believe you hit four gels at that last aid station! That's a great pic of the river crossing. I'm pretty sure that's where I fell in the river on the way back! Good times. Nice running with you most of the first half. Excellent finish! Wish I would have seen you at the finish. Had some issues with the ankle but thankfully was able to finish. Hope you are recovering nicely. @Trevor. It was great running together. Sorry about the ankle. Nice job muscling on to the finish. Don't know how I missed you. I stole away for a quick rest in the grass--could have been then. Great job Hank! To go from your first ultra to your first 100 in such a short period of time is truly impressive. A mixture of accomplishment and disappointment seems to be a popular theme among first-time 100 mile finishes. Maybe it's just about our expectations. I'm not sure. But, I hope by now you are simply feeling good about all you've accomplished, and that any sense of disappointment has transformed into determination and goal-setting for the next big thing. Also, thanks for the beautiful report!